This ultimate high-performance bit kit includes essential parts for repairing smartphones, tablets, and so on. All the screwdriver bits you need to repair electronics, smartphones, tablets, computers, game consoles and so on is in one handy toolkit. The handle is designed with human mechanics, which makes operation more efficient and convenient. 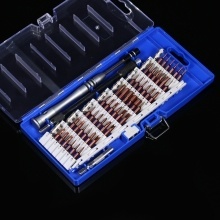 60 in 1 multi-functional precision screwdriver set, easily interchangeable. Comes with a storage case, convenient to store and carry. Transparent cover is simple but practical; internal tools are clearly visible. The handle is designed with human mechanics, which makes operation more efficient and convenient.